A few gems for you today. Earlier this week I talked about Prahran Market and their chocolate festival. 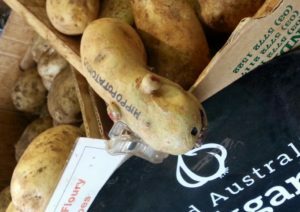 Here’s a final photo I took there, the Potato Man who is fourth generation Prahran Market has this wonderful potato as well many different types for buying. Would you believe this lovely typo is on their Facebook page? I wonder if the recipe is improved with ‘spring opinion’ as opposed to ‘spring onion’. This is a perfect reason why you should never use spell check, the word itself is spelled correctly so it’d pass spell check but it’s the wrong word. So while I’m talking about spell check. I’m reading a number of fairly new authors at the moment. They’re not published by traditional or large publishers and therefore do not have the support system they need. There are many typos and each one of them would have passed spell check as it’s a real word, it just happens to be the wrong word for the sentence. There are many different ways of proofreading your own writing but if you can afford a really good proofreader it will make such a difference to the final product.